A marriage and a lifetime of memories are the backdrop to a sweet, funny and often surprising comedy that is now playing at the Theatre Royal Stratford East. What is astonishing about this fast paced show is that even with over twenty characters are played by two people - Tony Jayawardena and Rina Fatania (pictured right) - you walk away from the show feeling as if you understand them all and want to see them again. Bindi and Mansoor are a popular couple on their street in Stratford. But after 45 years of marriage Mansoor has decided to swap Stratford for Delhi, shocking his wife and their friends. While he is waiting for his flight to Delhi at Heathrow Airport, Bindi conspires with their friends to make him stay. It helps that the flight has been delayed for many hours and this is the setup for the piece. Through a series of flashbacks and interactions, scene by scene this unlikely setup becomes increasingly more believable as the rationale for such a drastic decision taken by Mansoor is revealed. 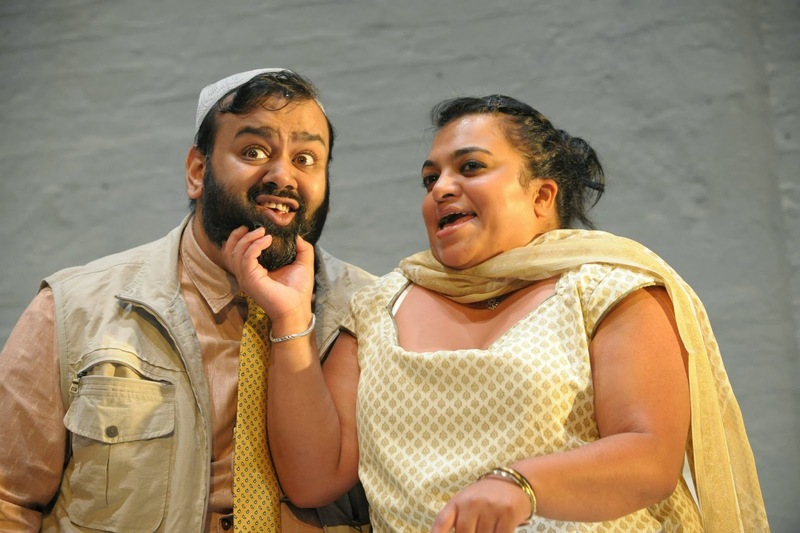 It helps to have a witty script by Tanika Gupta and the wonderful performances by the two leads who deftly switch between a variety of characters of different ages, sexes, sexualities and ethnicity (sometimes mid-sentence). It is a smart looking production as well. The performance is presented in a studio format which puts the audience right up close to the action, but through a series of simple props and some clever lighting you are transported through the years. There is also an Indian-fused version of "You're the One That I Want" from Grease that is worth seeing alone. Travel is often about going somewhere rather than the destination and this is a funny and in the end thought-provoking 80 minutes about life and love and the stuff that happens around it. All set against a romanticised version of Heathrow airport and Stratford it is hard to resist. It is selling out quickly and definitely a ticket to grab if you can. It runs until 5 October for now... It would be great to see it perform for a longer run.